How do you know if a room, home or building is contaminated with fiberglass particles? 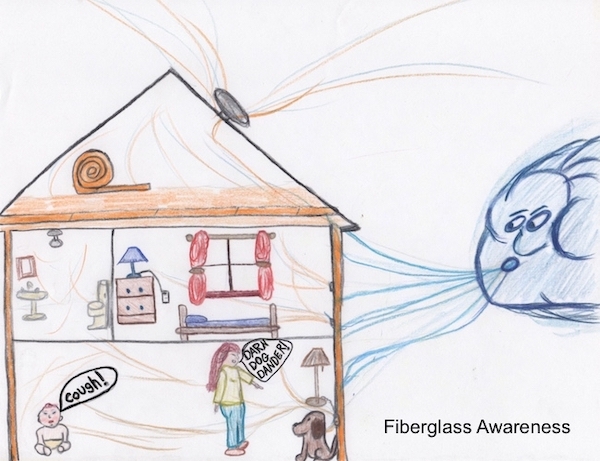 Airborne fiberglass cannot be seen with the naked eye and is often hard to detect, particularly if you are one of those people who cannot feel the obvious signs. The glass fibers do have binding agents attached to them, but I have yet to find an actual meter that distinguishes the glass particles from other small dust particles. Glass itself is an inert object, meaning it has no inherent power of action, motion, or resistance. Air quality tests do not even look for glass particles in the size range that shatter off of the spun glass. From my experience of being in many buildings that had fiberglass contamination, I know it effects people in different ways. Some have the obvious signs of sinus issues, coughing and burning eyes, while others get an upset stomach. Some do not appear to be effected at all. Logically speaking, if your body is busy trying to get rid of a toxin, it has less energy left to fight off other things or take care of the body in other ways. Toxins overload the liver and kidney and create inflammation which can cause a wide range of ailments. 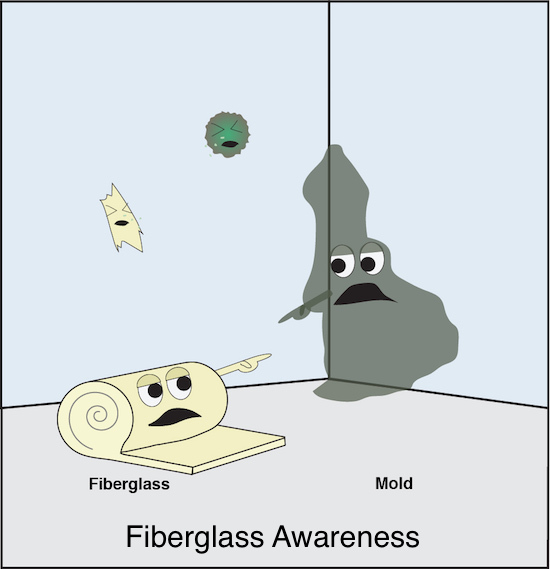 Fiberglass is a respirable durable fiber (RDF), meaning it is something you breathe in that the body cannot break down. I find that many people are indeed effected, but they are just used to the symptoms and do not know what is causing it, or just write it off as “having allergies”. Fiberglass can vary in smell or not smell at all. The smell coming from fiberglass is from the binder glue and the formaldehyde it releases into the air. Some of it has an almost unbearable burnt smell, to a sweet burnt smell, while other types remind me of urine. Sometimes it smells stale in a way that reminds me of a dusty old book that has been on the shelf for years, what I like to call "grandma's attic smell". If you can smell it, it's in the air. Sometimes it does not appear to have any smell at all, yet it is still being blown out of an air duct or coming out of a wall. If you walk into an area and your eyes start to burn, sting, itch or water, that is a sign that something is in the air. If you wake up with a sore throat or irritated airways it can be a sign. If your dog starts to sneeze a lot it can also be a sign something is in the air. If you can see it, there is a good chance it is, or will be airborne at some point. 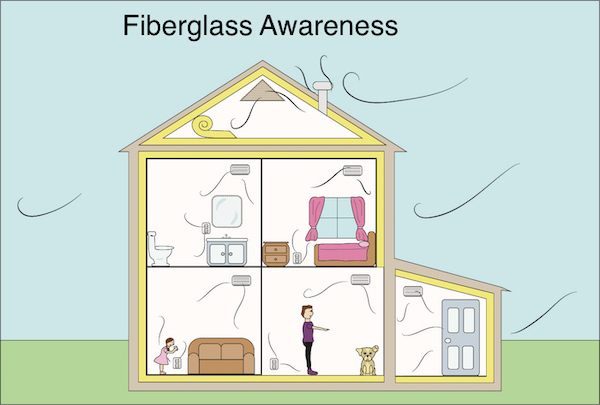 Fiberglass insulation is not meant to be exposed, yet many people are careless or just uneducated about how it becomes airborne. Floating glass particles are everywhere, from being vented out of gable vents to floating off of roof shingles, most people breathe it in daily without even realizing it. Ductwork is often lined on the INSIDE of the duct where air blows past it. This is common in stores, movie theaters, hospitals, schools, offices and industrial buildings. 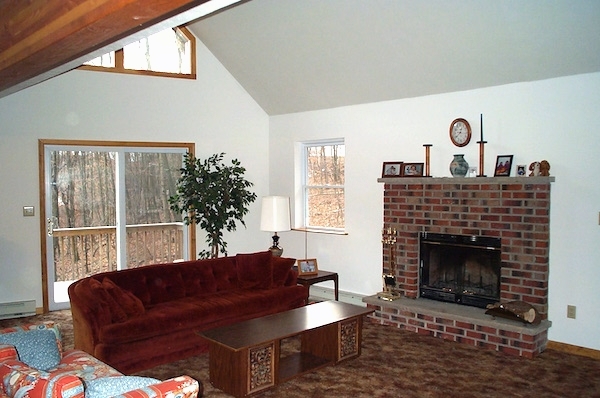 A building will often have time periods of negative pressure where air is being sucked from behind the walls through the fiberglass and out of the outlets and light fixtures. I find that even if a person can actively feel the signs of the floating glass, they do not become aware until they get out of it for a few days or more. This involves wearing brand new clothes and staying out of the most contaminated places. Then when the person goes back to the bad areas having been out of it for a period of time, their bodies will often alert them. Even then, the person will know they are not feeling well, but still will not know why. What also makes detecting fiberglass particularly hard is, since it is being vented out of buildings it is not just inside where air can be polluted. Your neighbors house gable vents just may be leaching into your ownb homes window. There are areas outside that I avoid because I can feel the air is bad. For example the air coming from a large neighborhood where everyone has their blown-in fiberglass vented out of their attics to the outside and I just happen to be down wind from the homes. There are many areas where we learned to avoid driving through. The symptoms are strikingly similar to Fibromyalgia symptoms. 1. Removal - The number one best way is to remove the culprit. This is not always possible. Fiberglass insulation can be behind the walls, in ductwork, in attics, above ceilings, in basements, under floors and more. Replacing the insulation with more of the same will only give you the same issue again in the future. If you are going to go all out and remove it, it makes more sense to find another alternative that will not become airborne. 2. Lower humidity - After a lot of trial and error I have discovered that the level of contamination seems to go down when the humidity is lower. I am not sure if it is because moisture in the air helps keep the microscopic particles airborne or because the moisture accelerates the breakdown process or both. I do know that water damaged fiberglass is one of the worst offenders. So it would make sense that humidity would help break it down. 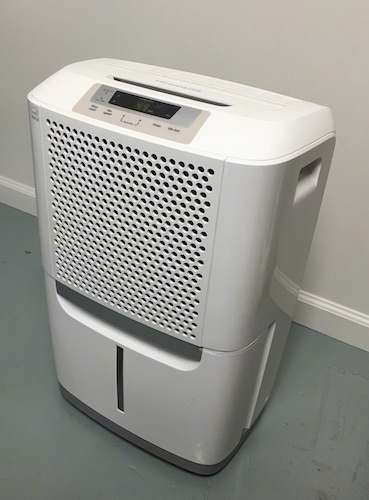 Humidity can be lowered with a dehumidifier. 3. Remove Carpets - Not only do some carpets themselves contain glass fibers that can become airborne, but a carpet will trap the particles providing a place for them to build up. A floor that can be mopped, removing all dust is best. 4. Smooth surface furniture instead of upholstery - Like carpets, upholstery traps in the particles. Whereas something such as leather can be wiped clean with a cloth. 5. Keep bedding clean - Wash your bedding often. Covering up your mattress and pillow with an allergy cover will help keep the microscopic particles from settling down deep inside your mattress. If you suspect you were in a contaminated area take a shower before turning in for the night. 6. Create a positive pressure environment - If the airflow in a room or building has more air leaving than it does coming in, a negative pressure is created. Air must be sucked in from somewhere, often sucking it out of the cracks in the walls, light fixtures and electrical sockets, which are often full of fiberglass, pulling the tiny particles out with it. Blowing fresh air in does the opposite, pushes the insulation back into the walls. 7. Seal it up - Seal up any cracks and/or holes where air could come out of the walls, floors and ceilings that contain fiberglass. 8. Check the duct work - Make sure it is not lined on the inside with a fiberglass liner. Check that the HVAC system does not have exposed fiberglass around it. Make sure all flex ducts are taped with duct tape and that there are no rips in it where the fiberglass is exposed to the air. 9. Avoidance - Avoid contaminated places. If you suspect a home, room or building is contaminated, do your best to avoid going there. Water leak? Flood? Did your fiberglass get wet? Are you getting sick more often? Mold usually gets blamed, but often times the problem is airborne fiberglass.